Join me for creative conversations on my You Tube channel! As I have healed so much of my own emotional pain, through my expressive arts practices. 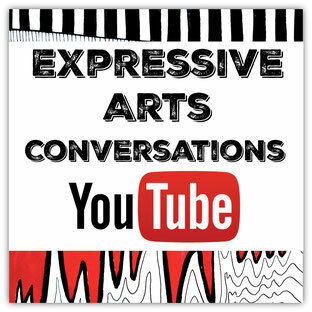 In celebration, join me for regular episodes of Expressive Arts Conversations! I was an expressive artist like many of us were when we were children. Prolific in my creativity, I remember selling my intuitive drawings door to door at age five! By the second grade, I was already becoming outer-directed in my art when I learned how to draw in school. In my twenties I was fully conforming to external norms as an artist. As a gallery artist, upon graduating from five years of college in art and design, my pre-planned paintings were elaborately patterned, technique based and aesthetically considered. Twenty years ago, during a period of family crisis and loss, my art wanted to become inner-directed, and my spontaneous creativity greatly intensified. It was during that time of emotional upheaval that I became a passionate keeper of expressive art journals. For many years thereafter, I devoted myself to deeply exploring one expressive art practice at a time until each journal was complete. I deeply delved into spontaneous painting, drawing and collage, as well as intuitive mandala making and devoted writing practices. Ten years ago, I began to share my expressive art practices with others. I earned my counselling designation in transpersonal counselling psychology, started teaching expressive art and writing e-courses around the world through my online therapy practice, and I facilitated expressive art full-time in Canada’s largest art studio for older adults for nine years. Let's Talk About the Expressive Arts! I work full-time as a counsellor and an online expressive art teacher, and I am unabashed in my enthusiasm for the power of the expressive arts to heal emotional pain, enlighten mental confusion, illuminate possibilities, and release the very best of who we authentically are into the world. I just love how spontaneous art brings out what is unacknowledged into the light of the present moment to be accepted, understood, loved and integrated. Expressive art frees us to play, loosen up and unravel who we think we are, so that we can remember our original selves!